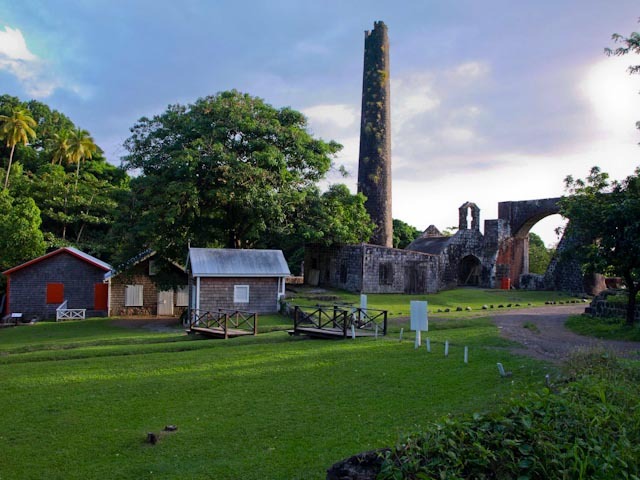 In this article on St Kitts attractions, I will take a look at some of the more popular historic sites in St Kitts that are located outside of Basseterre. 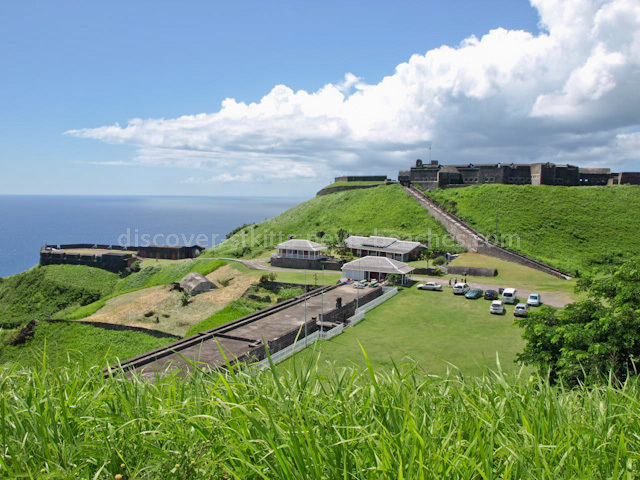 In my opinion, no tour of St Kitts is complete without a visit to these popular attractions, which include the Brimstone Hill Fortress National Park, a UNESCO World Heritage Site. Now don't get me wrong, there are lots of other heritage sites and attractions in St Kitts that you can visit, but if you are taking a tour of St Kitts, you should ensure that it includes stops at the St Kitts attractions listed on this page. 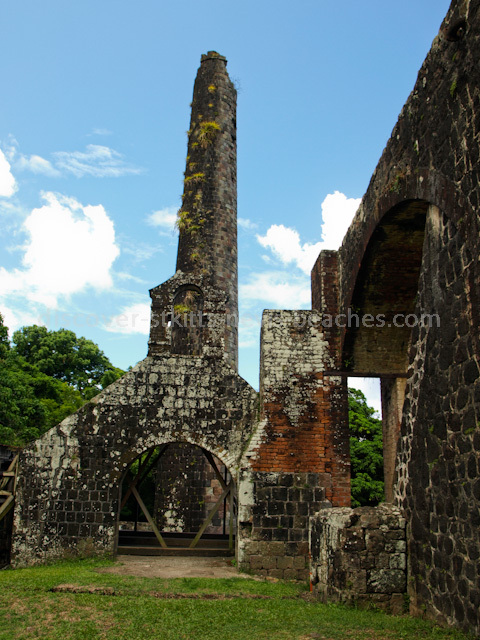 If you wish to read about the other heritage attractions located in Basseterre you can visit part one and part two of my St Kitts heritage sites article. 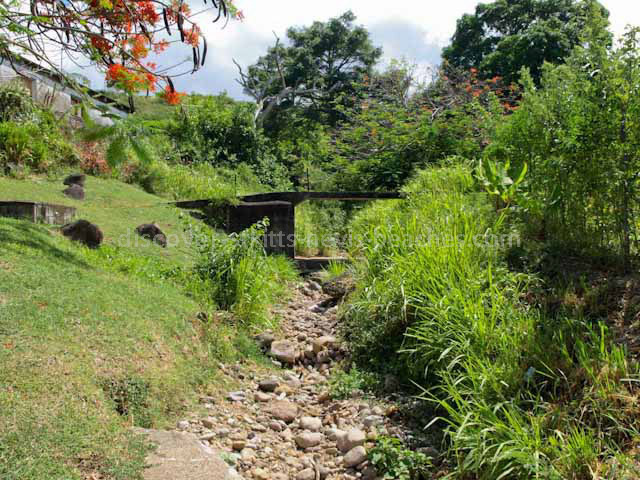 Originally called Pelham River, Bloody Point is a natural waterway in St. Thomas’ parish where it is said that the Kalinago (Caribs) met for religious purposes. At this same site in 1626, a combined force of English and French colonists ambushed the Kalinago killing so many of them that it was said the river ran red for several days. This St Kitts attraction is an amazing site where several dozen petroglyphs (rock drawings) may be found. It is also an area where geologists, historians, archaeologists and vulcanologists can find interesting scientific evidence worthy of investigation and discussion. Access to the site begins along the bank of the river near the island main road in Challengers, but then descends into the river bed itself, so it may not be easily reached during the rainy season when the river may be running. The trek includes climbing over rocks, which some persons may find fairly strenuous. About half way up there is a distinctively shaped rock from which water cascades during the wet season. 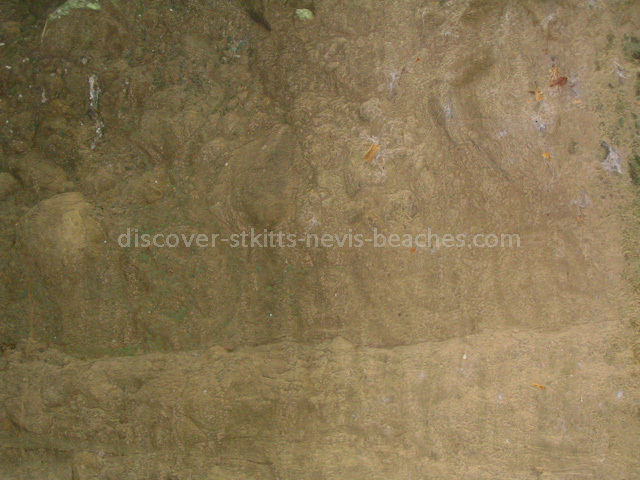 Two locations on St. Kitts where Carib Petroglyphs can be found are on the walls of the ravine at Bloody Point and Wingfield Road in the town of Old Road. 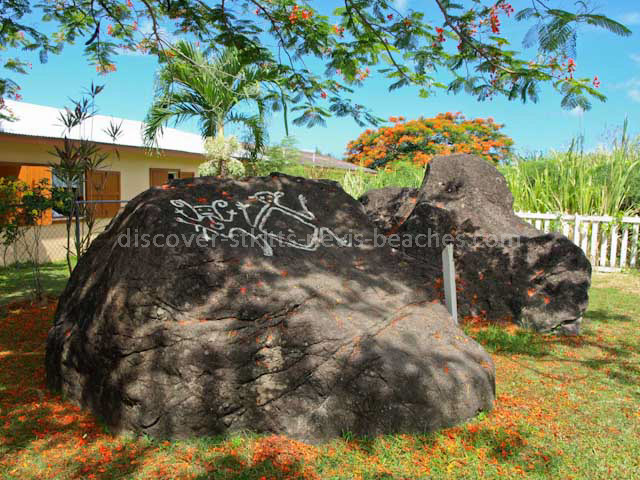 Besides the many interesting petroglyphs found at Bloody Point, the two which are most well known may be found on a rock on the left hand side of the road leading to Wingfield Estate (once the home of Earl Romney, but now housing the beautiful Caribelle Batik factory). The most popular explanation of these two petroglyphs are that they represent a male and female; however this is not a certainty as no one really knows how to decipher/translate these ancient petroglyphs. At present they are painted white; however they would have been natural when created. 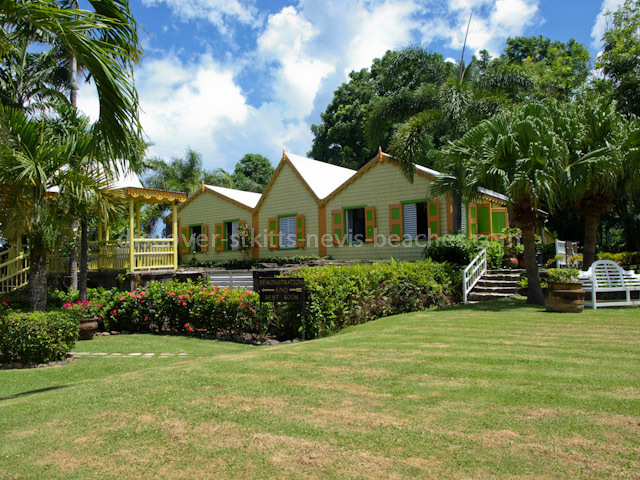 Located above the town of Old Road, the St Kitts attraction known as Wingfield Estate was established in 1625. Its first owner was Samuel Jefferson, the great great grandfather of Thomas Jefferson, third president of the United States of America. During the latter part of the 17th century, Mr. Jefferson sold a portion of Wingfield Estate to the Earl of Romney. The Great House at the estate was renamed Romney Manor by the Earl of Romney after he acquired it from Mr. Jefferson. The property remained with the Romney family for over 200 years. The estate was first established to produce tobacco. Cotton and indigo were also grown during the early years at Wingfield Estate. 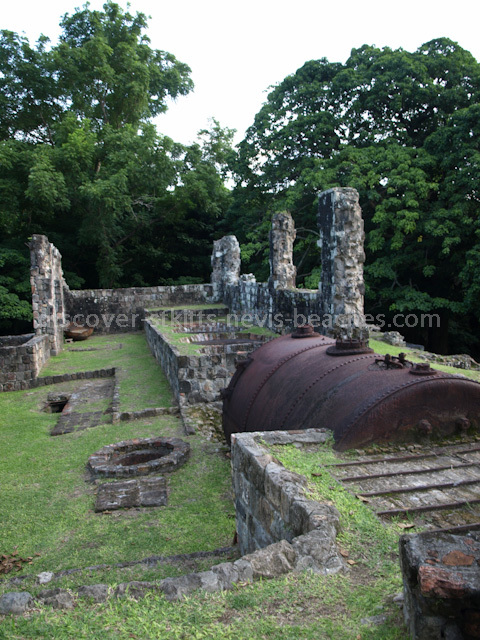 The estate switched to sugar and rum production in the middle of the 17th century, and this continued until about 1924. A variety of methods was used to crush sugar cane to extract the juice. These methods included animal power during the 17th century, water power during the 18th century, the steam engine during the 19th century and the modern combustion engine during the 20th century. 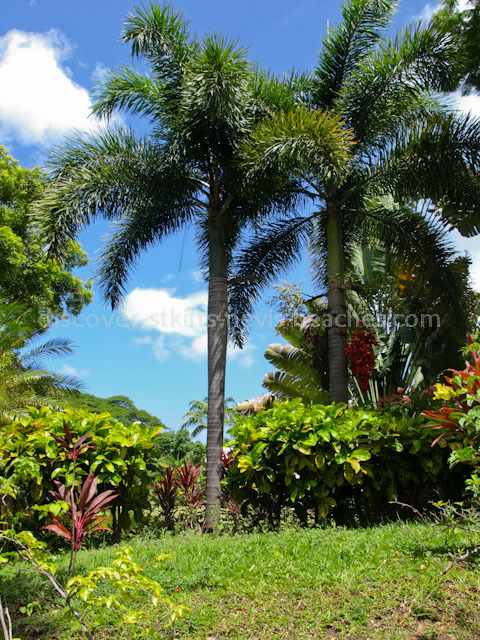 Today, Romney Manor is home to Caribelle Batik, a local batik making facility and about 12 acres of immaculately maintained botanical gardens. Since the fall of 2010, Wingfield Estate has been offering orientation and interpretive tours about the estate’s contribution to the history of St Kitts particularly in the areas of sugar and rum production. Wingfield Estate and Romney Manor are two St Kitts attractions that offer a variety of photo opportunities, so when visiting be sure to bring your camera along. Stops at these popular St Kitts attractions are included in most scenic half island and full island tours of St. Kitts. 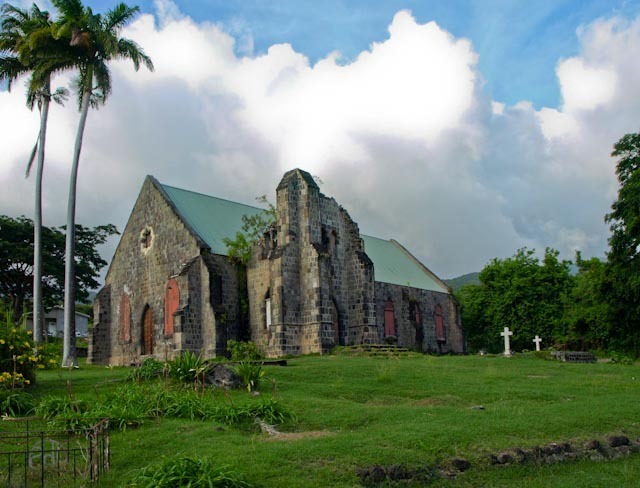 The St. Thomas’ Anglican Church located in Middle Island, St. Kitts is one of the earliest churches (Church of England) on St. Kitts. 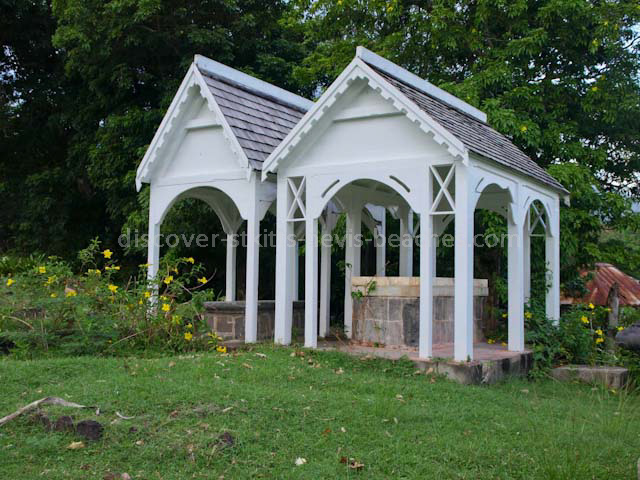 This St Kitts attraction holds the earliest records for baptism, marriages and deaths in St. Kitts. 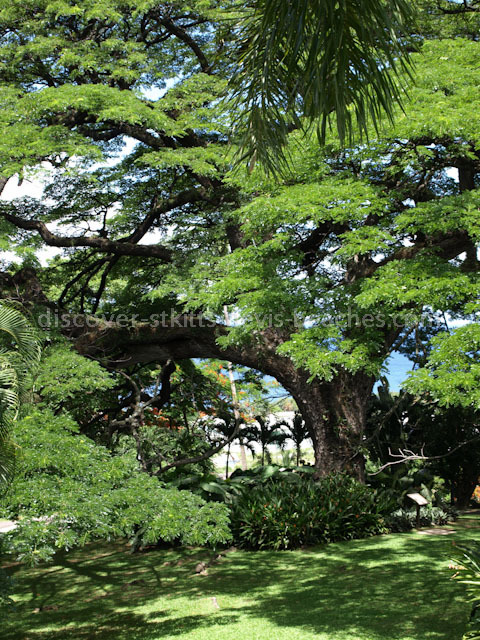 It is also thought to be the first Anglican Parish Church in the West Indies. Sir Thomas Warner is said to be the first European to land on St. Kitts. He arrived on January 28, 1623 and founded the first English settlement, and was the first English governor of St. Kitts. In the early part of 1625, Sir Thomas Warner recruited a priest, Rev. John Featley (some records show the name Rev. Tetley) who served as rector at the St. Thomas’ Anglican Church from 1625 to 1634. The original church is believed to have been built between 1625 and 1630. It was destroyed by hurricanes and earthquakes over the years. The present church was rebuilt in 1860. The death of Sir Thomas Warner on 10th March 1648 is recorded by the fact that his tomb is situated in the church yard of St. Thomas’, the Apostle, in Middle Island, the parish in which he landed. Next to his tomb is that of his friend Samuel Jefferson, ancestor to the third president of the United States of America, Thomas Jefferson. The bell tower of the St. Thomas' Anglican Church was destroyed in 1974 during an earthquake and has yet to be repaired. Brimstone Hill Fortress National Park is said to be one of the earliest, most extensive and best preserved colonial structures in the Americas. Once known as the Gibraltar of the West Indies, the Brimstone Hill Fortress National Park was inscribed as a UNESCO World Heritage Site in 1999. Offering spectacular views of mountains, cultivated fields, settlements and neighbouring islands across the Caribbean Sea, the Brimstone Hill Fortress National Park is a photographer's paradise and is most likely one of the most photograhed St Kitts attractions. The amenities at the site include a Visitor's Centre with free video show, the Fort George Museum at the Citadel, a Canteen/Snack Bar and a Gift Shop stocked with local craft, historical prints, books, CD's and other items, all at attractive, competitive prices. The Fortress is located on a hill some 800 feet high on the Western coast of St. Kitts on the periphery of the town of Sandy Point. The name “Brimstone” Hill is attributed to the smell of sulphur in the area, which is said to be sulphurous gases emitted from a volcanic vent in the sea below Brimstone Hill. The history of the Brimstone Hill Fortress dates back to 1690 when the first cannons were mounted on Brimstone Hill by the British, a move that proved successful in recapturing Fort Charles (located on the coast below) from the French. Going forward, the strategic importance of Brimstone Hill as a place of defence was realised by the British and fortifications were designed by British Army Engineers. Enslaved African workers provided the labour for the construction of the Fortress. 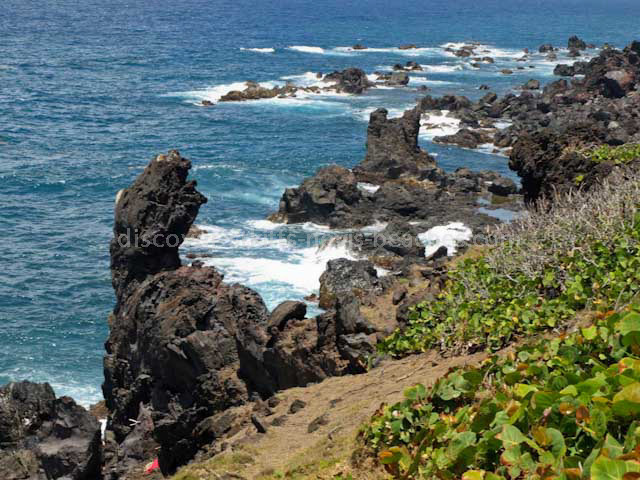 The St Kitts attraction known as Black Rocks is the natural result of the hot lava from a volcanic eruption combined with cold sea water causing this picturesque phenomena. 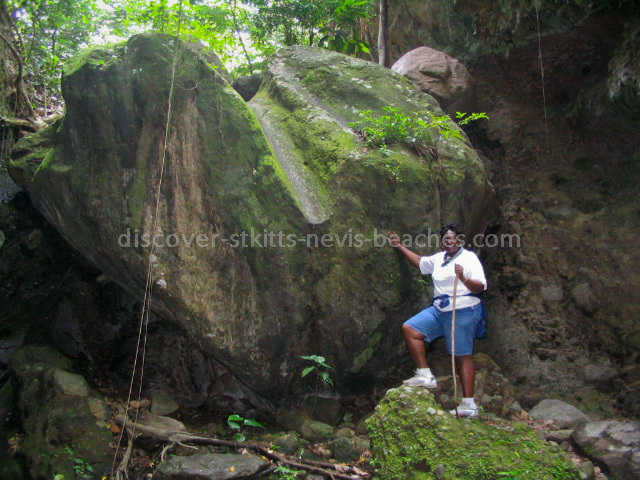 The rocks form a plateau of cliff approximately 100 feet above sea level near Belle Vue Estate on the north east coast of St. Kitts. The site affords views of St. Eustatius, St. Martin and St. Bartholomew. The texture of the rocks is rough, spiky and sharp and waves from the Atlantic Ocean crash against them creating amazing photo opportunities. Erosion over time has caused the coastline where people may stand to view the scene to recede making this site an endangered one. Previously the site was used as a popular picnic area. Recently several small buildings were erected to provide accommodation for hospitality businesses from the community to allow them to provide products and services to the tourists and locals who visit the area.